The stunning doors !!! TEHNI Pivot doors. The impressive doors, without hinges. The operation is based on an axial pivot point and that makes it ideal for big dimension doors. impactful and beautiful design options, amazing strength, powerful hardware, massive panels, open with ease, all combine to make TEHNI pivot door the number one choice for entry doors. Excellent sealing, with the use of specially designed EPDM rubber gaskets with continuous central gasket at the door's sash offers a high level air tightness, waterproofing and insulation. TEHNI Pivot doors, use special anti-distortion polyamides that provide thermal break to the system, in combination with the XPS core achieve optimal thermal insulation. 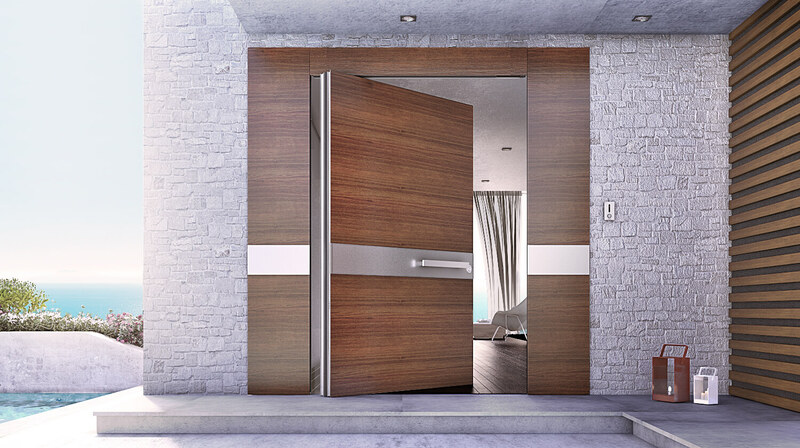 Additionally, the polyamides minimize the operational problems and accommodate the deflection of the door due to the temperature difference between inside and outside. Low threshold that provides easy access, suitable for people with disabilities. Optionally installation over or flush with the floor. Standard automatic 5-point lock. More lock options for higher security with 17 points lock. Fingerprint or Keyboard electronic locks available.